Why have Diversified Design Group design your sound system? Allows the sound system to be competitively bid. This cannot be done with an installer designed system. Sound system is coordinated with room acoustics. Consultant helps establish budgets and then designs the system to meet the budget. We provide complete bid document drawings and specifications. Comprehensive bid documents allow unbiased, competitive bidding of the systems. Money is saved by having Diversified Design Group, Inc. representing the best interests of the owner and architect. In spaces where musical quality and speech intelligibility are essential, the sound system must be coordinated with the acoustic design of the room. It is essential that echoes and detrimental reflections not be introduced by a sound system design that is not properly coordinated with the acoustics of the space. Our sound systems are carefully designed utilizing the acoustical data and parameters obtained during the acoustic design of the room, in conjunction with electro-acoustic modeling and other required calculations, to accurately predict the performance of the sound system in terms of frequency response, sound coverage and speech intelligibility. For theaters and auditoriums, we include in our designs all sub systems required. We work closely with the theater consultants. Plus, our own knowledge of theater operation allows us to provide the owner with the technical systems that are required for current and future productions. We help the architect establish budgets and then fine tune the budgets to fit the project. Our designs are then established with the intention that the final bids fall within the budget. We provide complete drawings and specifications that become part of the bid documents. These drawings include electrical contractor and sound contractor requirements so that the bidders have a complete picture of the scope of the project.The drawings show conduit layouts, grounding and final sound system details. This provides accurate bids and a complete/coordinated system. As professional independent consultants, we do not represent any manufacturers, resellers or distributors of components. This allows us to specify several brands of product that are truly equal. As a result, the owner gets a quality system and the bidding is equally competitive. As the consultant, we are the architects and owners representative throughout the budgeting, design and construction phases. We help resolve problems that may occur during construction and perform a final checkout and punchlist when construction is completed. We provide the final tuning, balance the systems and ensure that the owner has received instructions. We look after the best interests of the architect and the owner in dealing with the technical systems and ensure that they receive a system that is complete and according to specification. Our fees are more than made up by lower and more accurate competitive bids on the designed systems. 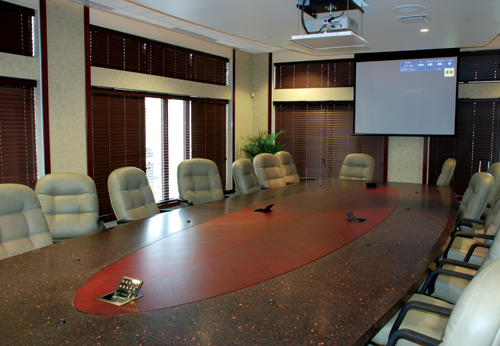 Why have Diversified Design Group design your video system? Allows the video system to be competitively bid. This cannot be done with an installer designed system. Video system is coordinated with the architecture of the space. All interfaces to the sound and control systems must be properly integrated to produce a comprehensive and reliable overall system design. We help establish realistic budgets and then design the best possible system to meet the budget. When a vendor/installer is providing the system design, it is hard to be certain that the products specified are the best value for the owner or for the vendor. Diversified Design Group, Inc. represent no manufacturers and derive no commissions or compensations from any vendors. We work as part of the design team and solely represent the best interests of the owner and architect. When designing a video system we take special care to integrate the system into the architecture of the space. Our extensive experience and knowledge of video system design, coupled with our understanding of technological advancement trends in the industry, allow us to insure the infrastructure of the designed systems will accommodate future upgrades and/or expansions with a minimum of additional expense. Great care is taken to insure ambient noise from all system devices is kept to a minimum to prevent unnecessary negative impact to the acoustical usefulness of the space. Video systems often integrate with the sound systems in the space. It is crucial to have these systems properly matched to insure high quality results. We also provide design of any required control systems to allow efficient operation of the overall sound and video systems. Our system designs include complete drawings and specifications, including conduit layouts and power requirements, to allow equal competitive bidding of the system. 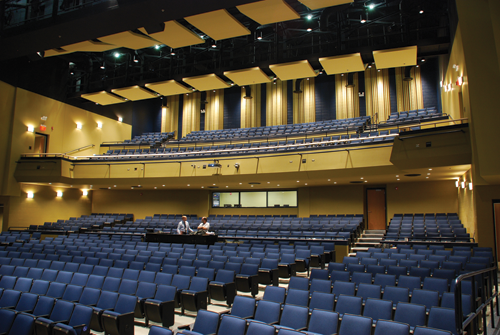 Many of today’s spaces, such as theaters, auditoriums, lecture halls, sporting complexes and churches, require the integration of multiple systems (sound, video and control), along with proper room acoustics. Utilizing Diversified Design Group, Inc. for all audio/video/control systems provides a comprehensive, efficient and accurate design/installation process. The savings accrued by allowing Diversified Design Group, Inc. to provide a complete systems/ acoustic design and the competitive bidding of these systems, more than pays for our design fees.